Figure 2 Round pneumonia in woman who presented with fever and cough. 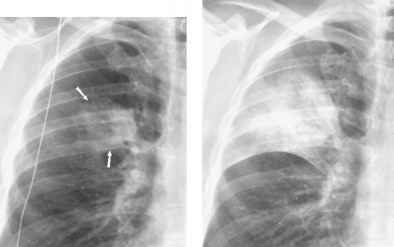 (A) Chest radiograph shows poorly marginated opacity in the right upper lobe (arrows). (B) Follow-up radiograph performed 48 hr later shows diffuse consolidation in the right upper lobe. Although more common in children, round pneumonia is occasionally seen in adults . are important in determining patient management. Management of a nodule depends on the likelihood of malignancy and includes observation, resection, and biopsy. Observation is usually undertaken if the probability of malignancy is low or the patient's clinical status either precludes further evaluation or suggests a nonmalignant etiology. 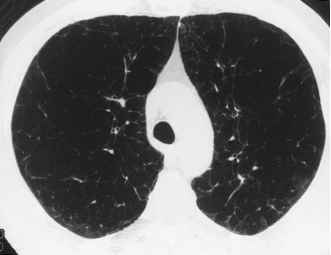 For instance, in a patient presenting with a new focal abnormal pulmonary opacity and clinical findings of pneumonia, radiographical reassessment after a short interval may be all that is necessary to exclude malignancy and confirm a diagnosis of round pneumonia (Fig. 2). Surgical resection of a solitary pulmonary opacity is usually performed when the probability of malignancy is high. Thus, if a new nodule is detected in a young adult with a peripheral sarcoma, this is most likely a solitary metastasis and resection is commonly performed. For cases between these two extremes, biopsy is frequently performed, using bronchoscopy, transthoracic needle biopsy, or video-assisted thoracoscopy. Figure 3 Histoplasmoma. Computed tomography shows diffusely calcified nodule in the left upper lobe. Note small calcified lymph node within mediastinum. Diffuse calcification is indicative of a benign etiology and, in the absence of a primary osteosar-coma, no further evaluation is required.